As the sequel to PGA Tour 96, the 1997 edition had big shoes to fill. 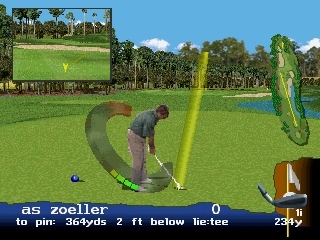 EA’s first attempt at a golf sim on the Playstation was nearly flawless, and they could have basically phoned this one in by releasing the same game with two new courses and maybe a couple of new PGA pros. The game does feature two new courses; TPC at Sawgrass, which is located in northeast Florida and is home to The Players Championship tournament, and The Links at Spanish Bay, a true links course, located on the Monterrey Peninsula. No new players were added however, as the game features the same 14 tour pros. EA tried to improve the game’s graphics by apparently digitizing actual photos of the course, but the results are mixed. Sometimes it adds a new level of detail to the view, and sometimes it makes the game look more pixelated and grainy. They also added a second camera angle which shows up in a little pop-up window. This reverse-angle view appears both when you are aiming your shot so that you can see the back end of the target arc, and after your swing so that you can see your ball arrive. While it is a neat feature, it takes a couple of seconds to load and this delay gets old after a while. The sound has been improved somewhat, with the addition of more ambient noises like waves crashing into the shore and ships’ horns in the distance on the Spanish Bay course, but TPC at Sawgrass sounds just as silent as the courses in PGA Tour 96. The announcer now comments on every shot before and after, but sounds more like a combination caddy and narrator than broadcast-style announcer. Although I don’t care for the graphical changes to PGA Tour 97, the game has the same feel as the previous title, and the addition of a links course is an added challenge. If you’re tired of the two courses in the 96 edition, there is no reason not to pick this game up. Buy PGA Tour 97 on GameGavel or Amazon. Tagged 1996, Golf, PGA, PGA Tour 97, Playstation, PSX, Review, Sony, Sports. Bookmark the permalink.